Evoqua introduces a high flow solution specifically for Total Organic Carbon (TOC) reduction where realization that organics species can impact yield at every process stage that the product comes in contact with water. Evoqua introduces a high flow solution specifically for Total Organic Carbon (TOC) reduction where realization that organics species can impact yield at every process stage that the product comes in contact with water. 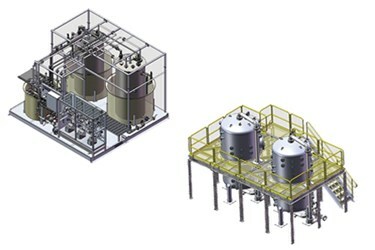 This treatment system can treat hundreds or thousands of gallons per minute surpassing the International Technology Roadmap for Semiconductors (ITRS) requirements for the foreseeable future. Our proprietary advanced oxidation process the - Vanox AOP - can consistently reduce TOC to 0.5 parts per billion (ppb) and treat seasonal TOC variations in feed water. This is important as organic carbon elevations above 1.0 ppb can directly affect the manufacturing process shown to significantly impact product yields. The repeat orders for Vanox by nearly every factory they are placed in are an indicator of how these tools are a valuable return on investment. Recent discoveries that the species of TOC is as important as the quantity of TOC's has generated interest on our patented process that attacks the specific TOC species that has the greatest impact on microelectronics productions. Species, such as urea, are the hardest to remove using the conventional UV or UV Peroxide / Ozone technology but are readily reduced with the Vanox solution. The Vanox system removes and / or controls urea primarily associated with THMs (Trihalomethane), such as chloroform, which is generated as a byproduct from the use of chlorine. The system also addresses urea and IPA, the primary organics that can require a more elaborate treatment. These difficult to control organics have been proven to impact yield and device performance especially at the most demanding process steps.